While there are many memorials around the country that celebrate civil rights icon Rosa Parks, few are as prominent as Rosa Parks Circle in downtown Grand Rapids, Michigan. This lively and commemorative public space was conceived by Maya Lin, perhaps best known for designing the Vietnam Veterans Memorial in Washington, D.C. The 3.5-acre space has been synonymous with the heart of Grand Rapids for over 150 years — first as Grab Corners, later as Campau Square. When the downtown area began to suffer commercially in the 1970s, city officials hoped to bring back shoppers with a pedestrian mall. That failed to attract the community and commercial activity officials had hoped for, and planners went back to the drawing board. In 1995, the city turned the northernmost section of the pedestrian mall into Rosa Parks Circle and reopened the remaining area to automobile traffic. 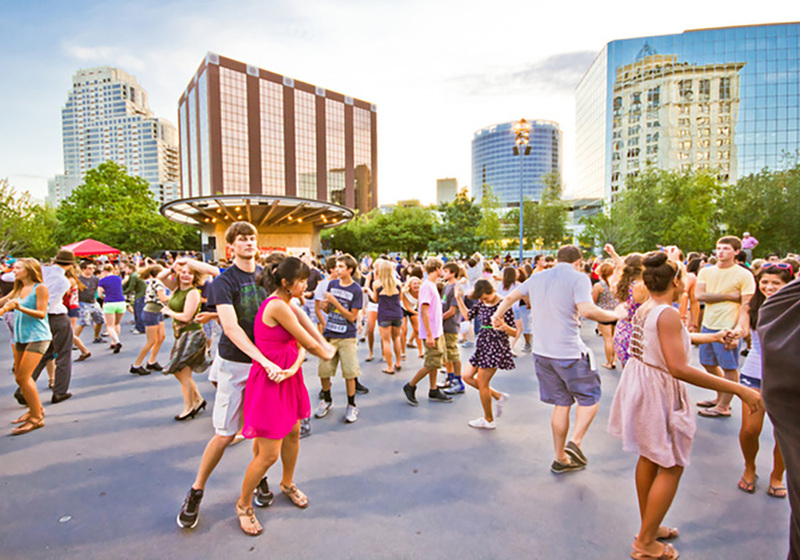 Grand Rapids Swing Society provides free swing dancing every Tuesday night in the summer. Photo courtesy Experience GR. The redesign has been a profound success and serves as a defining example of reinvention. The plaza has been credited with helping to activate the surrounding neighborhood by spurring redevelopment and drawing in restaurants, galleries, and shops, as well as an important institutional anchor — the Grand Rapids Art Museum. Rosa Parks Circle now provides a much-needed central public space for year-round community events such as cultural festivals, weekly dance classes, ice skating, and even public viewings of the Olympics. Located just east of the Grand River in the heart of downtown, Rosa Parks Circle offers spectacular views of the city and is once again one of its most vibrant and active areas. 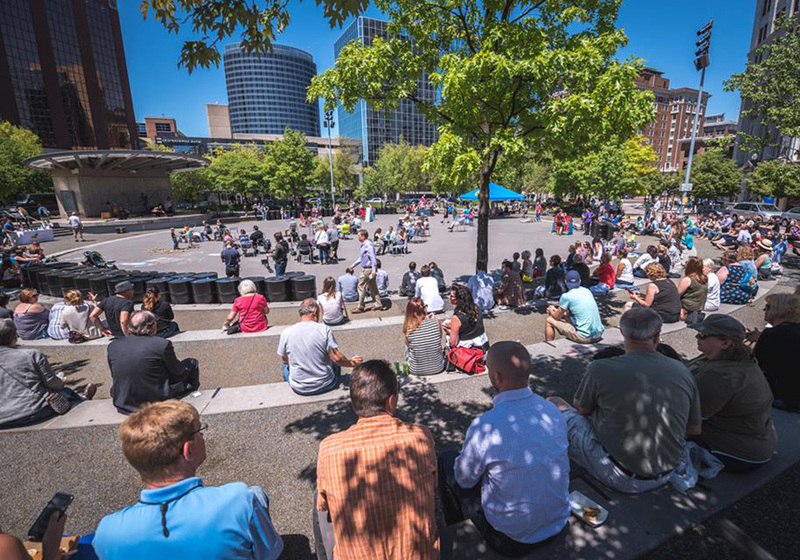 Every Thursday in the summer, Relax at Rosa brings local musicians, food trucks, oversized yard games and other programming for the lunchtime crowd downtown. Activities like have made Rosa Parks Circle the most-visited park in Grand Rapids. Photo courtesy DGRI. The plaza was named for Rosa Parks in 2001. A statue of the civil rights activist and long-time Michigan resident was added in 2010. The park includes grass mounds that reflect the local topography of Grand River and help to orient its visitors. Designer Maya Lin sought to celebrate the city's connection to water by representing it in three forms: liquid (flowing water), vapor (a mist fountain), and solid (the ice rink). Tiny fiber-optic lights under the ice rink's surface depict the configuration of the stars over Grand Rapids on January 1, 2000. In the summer, the ice rink serves as an amphitheater for performances or simply people watching. The park features two pieces of art: Maya Lin's work Ecliptic, inspired by the Grand River, and sculptor Ed Dwight's public art piece of Rosa Parks, commissioned in 2008 for installation around the perimeter of Rosa Parks Circle in September 2010. The triangular park fits between Monroe Avenue NW, Monroe Center Street NW, and the Grand Rapids Art Museum. 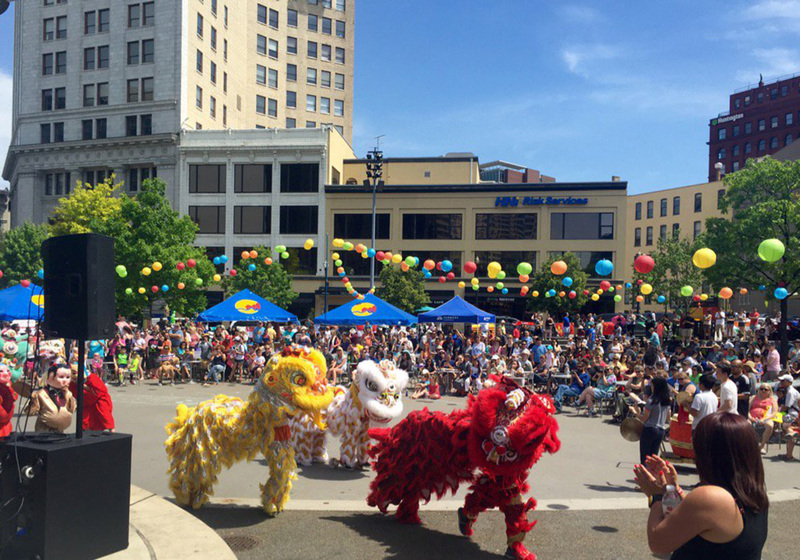 Grand Rapids Asian Festival, June 2017. Photo courtesy Mayor Rosalynn Bliss.